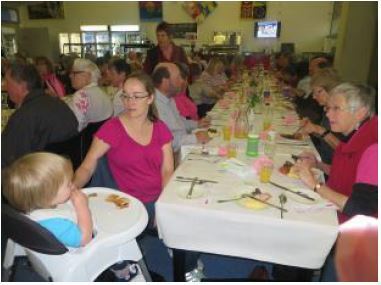 Dragons Abreast Northern Tasmania Inc (DANTI) felt it had too much going on through October/November to be able to tackle the pink breakfast at the Launceston General Hospital this year, so we offered the event to our friends, the Launceston branch of Breast Cancer Network Australia (BCNA). Many thanks to the 15 DANTI members and friends who supported this. Especially Thomas. And thanks to the Launceston General Hospital, especially Trisha-Maree who set up the tables and provided an early breakfast for us. Denise Delphin, from the Northern Suburbs Neighbourhood House, offered the Welcome to Country, and gave a good breakdown of all that these Neighbourhood Houses are achieving. Excellent programmes and Denise is a real driving force behind these schemes. 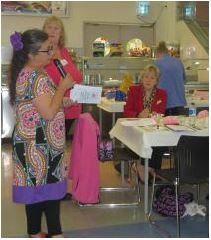 Well done to our friends at BCNA Launceston.